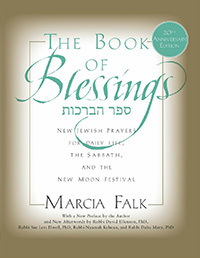 Marcia Falk is the author of The Book of Blessings: New Jewish Prayers for Daily Life, the Sabbath, and the New Moon Festival, now available in a 20th anniversary edition. 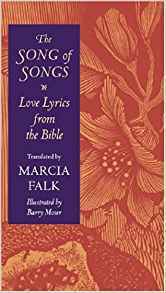 Her other books include The Days Between and The Song of Songs. She was a university professor for 20 years and also is a painter. Q: Why was this new edition of The Book of Blessings published, and what has been updated in the book? A: The main purpose of this new edition is to introduce the book to a new generation who may not be as familiar with it as those who came to know it when it first appeared, in 1996. This edition contains a new preface in which I address, meditatively and poetically, several of the issues that have been brought up by readers over the years. 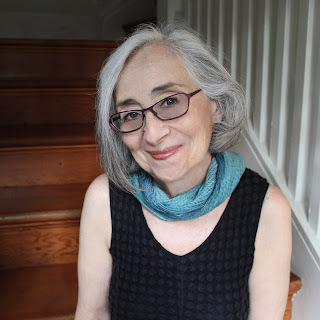 Also, for this edition, my publisher, the Central Conference of American Rabbis Press, enlisted four Reform rabbis—two from the United States and two from Israel—to write afterword essays about the history of feminist liturgy and how they felt the book had influenced various communities in America and Israel. Q: What changes have you seen since the first edition of this book came out when it comes to attitudes toward gender-neutral language and a feminist approach to prayer? A: Gender-neutral language is far more commonly accepted today than it was 20 years ago. Feminists, of course, have been largely responsible for this shift in attitudes. My own understanding of feminism has led me beyond the idea of gender neutrality. My liturgy challenges theological hierarchies and seeks to give voice to the relationship between humanity and the whole of creation. Q: What impact do you think the book has had over the years, and what do you hope readers take away from this new version? A: The American rabbis who contributed afterwords to the new edition wrote about how the book has influenced the development of new liturgies and prayer books within the mainstream denominations of Judaism, as well as within newer movements and communities seeking a more spiritual approach to prayer. I was very moved to hear, from the two Israeli writers of afterwords, that progressive Jewish communities in Israel have adopted sections from the book, in their services and that it has influenced the Movement for Progressive Judaism that is creating new Hebrew liturgy. Israelis are particular about their Hebrew, and I’m thrilled that the Hebrew blessings and poems in the book speak to them. Q: Who do you see as the readership for this new version of the book? A: I hope The Book of Blessings will continue to speak to individuals and communities dissatisfied with the patriarchal liturgy and looking for fresh language and theology they can relate to. Beyond this, it’s my wish that readers, especially younger readers, will find the book responsive to their own visions, needs, and concerns. A: I have two projects in progress. One is a book for Passover, similar to my book for the High Holidays, The Days Between (published by Brandeis University Press in 2014). 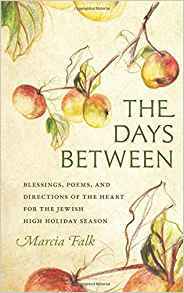 The Days Between provides blessings, poems, and meditations for Rosh Hashanah, Yom Kippur, and the 10-day span between them. The Passover book will include blessings and meditations for the Seder as well as poems and meditations for the whole of Passover week. The other project I’m working on, which I hope to publish this fall, is a book of blessings and poems accompanied by my paintings. It’s called Inner East and is based on the traditional Jewish mizrach (the word means “east”), a decorative plaque to be hung on the eastern wall of the home, indicating the direction to face in prayer. My mizrach is intended to guide us to an inner focus of contemplation and the prayer of the heart. A: Poetry and painting are the twin passions of my life, and I have worked to make my blessings the best poetry I could. I believe that all prayers should be poems because the rabbis considered authentic prayer to be “the worship of the heart,” and poetry is the genre quintessentially directed to the heart. Visual art can stir us in similar ways, and so I have joined poetry and prayer in my re-creation of the mizrach form—a relatively new creative project for me.